This is part of an outline for a novel I’m working on. It’s basically a storyboard broken down in these little boxes, according to chapter. I know what you’re thinking. You’re wondering if I’m afraid of people stealing my ideas since I just put my notes on the Internet. Well, I would be, if I didn’t write it in new-school hieroglyphics that only I can decipher. Go ahead. Try to read it. You’ll get nothing but a headache. Some call it chicken-scratch. I like to think of it as genius-scribble, or handwriting 2.0. Anyway, the point is, this is where it starts. 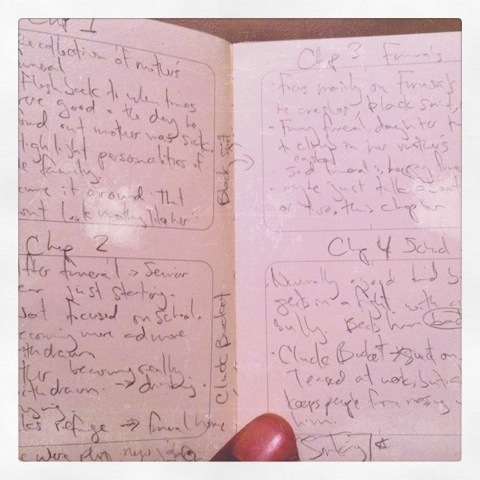 A bunch of messy bullet points in a moleskine. The early fleshings of an idea. The bones. But it’s so amazing to think about what this will soon become.